When deciding where to live, you’re going to take into account a number of factors. And if you’re one of the 43.3 million households in America who have at least one dog, there’s no doubt you’ll include your cuddly canine in the equation. Dog owners will want to make sure the place they call home is well-suited for their pup to live its best life. SmartAsset did the research for you to find the best places for dog owners and their four-legged friends. To find the most dog-friendly cities in 2017, SmartAsset looked at a few different metrics. For example, we looked at the number of dog parks and dog-friendly restaurants and stores. We also checked out cities’ walkability and home values to make sure both pup and owner are living comfortably. For more on where we got our data and how we put it together, see the data and methodology below. This is the 2017 edition of this study. Read the 2016 analysis. San Francisco holds strong – Dog owners in San Francisco can take pride in the fact that for the second year in a row the City by the Bay claimed our title of the most dog-friendly city in America. A familiar top 10 – Nine cities that made our top 10 list in 2016 are back on the list this year, including the aforementioned San Francisco. This year, we also welcomed Phoenix, Arizona to the dog pile for offering plenty of dog-friendly spaces and good weather! Take your pup out west – Thirteen of the top 25 cities are located in the western United States. 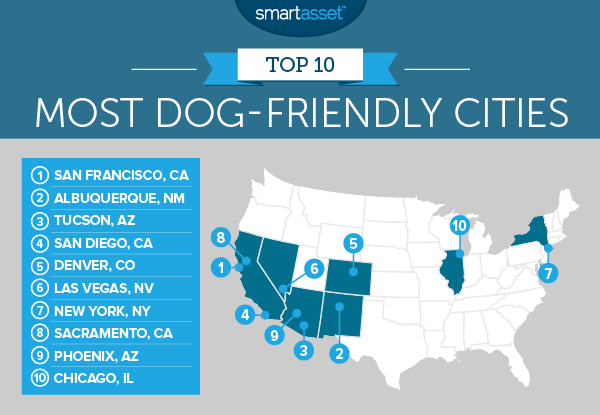 California and Arizona, specifically, dominated our top 25, with five California cities and four Arizona cities making themselves super dog-friendly. Just like last year, San Francisco comes out golden in 2017. If you can stomach its high cost of living, SF provides a great place to live with your canine friends. It has the second-most dog parks per 100,000 residents in the top 10 and ranks third in walkability overall, making it ideal for dogs to run around and play. You won’t have to worry about leaving your dog at home when you go out to eat, either. 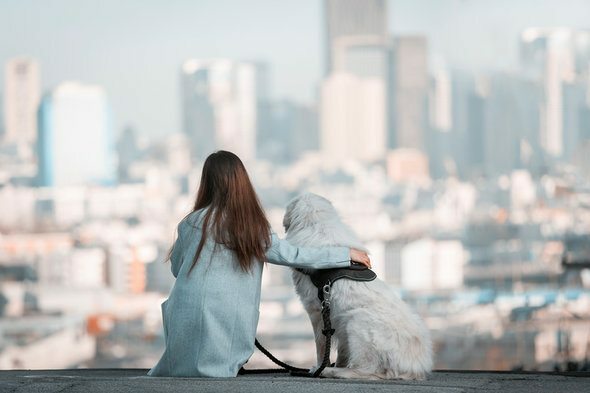 San Francisco has around 170 dog-friendly restaurants, meaning that no matter what you’re in the mood for, you can take your pup along with you. Looking for a warmer climate? Check out The Duke City, up from last year’s fifth spot, where there’s only about 28 days of rain a year. In fact, Albuquerque has the third-most dog parks per 100,000 residents in the top 10. When you’re done playing fetch and need some grub, you can head to one of over 50 dog-friendly restaurants in the city. Plus, despite its desert location, Albuquerque’s relatively affordable housing market won’t leave your bank account bone dry. Our third-most dog-friendly city scores well partially due to its affordable homes. But, of course, the city can offer you and your cuddly canine more than just a nice pad! Making its way up six spots from last year’s ranking, Tucson has the eighth-most dog-friendly shopping centers in the study and over 50 dog-friendly restaurants. Old Pueblo’s desert climate means a low number of rainy days, too, so you and your dog can head out and bask in the sun. If you and your dog are an inseparable pair, you’ll have no problem living in San Diego. Why’s that? San Diego boasts 200 dog-friendly restaurants, the most of any city in our study. It also has the sixth-most dog-friendly shopping centers in the study, meaning you and your dog never leave each others’ sides. 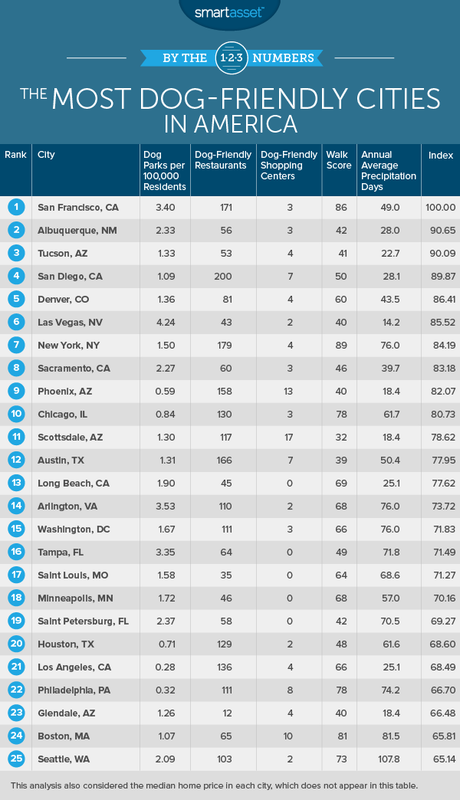 America’s Finest City scored decently in walkability, but might be a bit lacking in dog parks. Luckily, you can still head to a dog-friendly beach for Fido’s daily ocean-view walk! Rather than standing out in a single metric, the Mile High City impresses by posting solid scores throughout all our metrics. Owning a home in Denver can be affordable and the city has a below-average number of days with precipitation per year. When it comes to making your pooch happy, there are around 81 dog-friendly restaurants throughout the city and a little over one dog park per 100,000 residents. Although down a few spots from last year’s list, Sin City surprisingly has the most dog parks per 100,000 in the top 10. Pair that with the city’s mere 14.2 annual days of rain, and you’ve got a great opportunity to take your dog out for long walks. Plus, with low housing costs, you can treat yourself and your canine pal with a trip to over 40 dog-friendly restaurants in the city. Infamous for its cramped apartments and exorbitant cost of living, New York might not have been your top dog-friendly pick. However, New York has proven to be pretty dog-friendly and even climbed three spots from last year’s ranking! The city is incredibly walkable, making it easy to take your pup out for a stroll to any number of parks or to your favorite bodega. Even if you’re looking for a sit-down meal, you can choose from around 179 dog-friendly restaurants throughout the city. You’ll just have to enjoy the warm and sunny weather while you can, because the city sees its fair share of precipitation. Nicknamed the City of Trees, Sacramento already sounds like a great place for dogs! It’s also the third California city to crack our top 10. Besides its greenery, the city has a number of dog parks, leaving you free to frolic with your best friend. Sacramento also has average 60 dog-friendly restaurants so you won’t have to leave your pal behind. The sole newcomer to our list, Phoenix stands out by having the most dog-friendly shopping centers, second only to Scottsdale, Arizona. Phoenix also has 158 dog-friendly restaurants, the sixth-most of our list, making Phoenix a great place to take your pooch out for your lunch plans. Although Phoenix doesn’t have a great walk score, you won’t really need to plan around rainy days to take your dog for a walk. Closing out our top 10 is the Windy City, where your dog can hang out of the car window to its heart’s delight. Or almost to its heart’s delight, since Chicago has the second-most average days of precipitation a year in the top 10. However, Chicago scores sixth in walkability in the study. So in the colder months, you could consider putting your pup in a holiday sweater and booties and still head out for a nice walk! And regardless of weather, your destination could be one of the city’s 130 dog-friendly restaurants or three dog-friendly shopping centers. Dog parks. This metric looks at the number of dog parks per 100,000 residents. This is 2015 data from the Center for City Park Excellence, The Trust for Public Land. Dog-friendly restaurants. This factor looks at the number of eateries that welcome dogs in their outdoor seating areas. This data comes from bringfido.com. Dog-friendly shops. This metric represents the number of shops that will allow dogs inside. This data comes from bringfido.com. Median home value. This is meant to be a measure of a city’s affordability. This data reflects one-year estimates from the Census Bureau’s 2015 American Community Survey. Walk score. This factor measures the walkability of each city. This data comes from walkscore.com. Average annual days of precipitation. This metric looks at the average number of days a year that a state gets precipitation. This data comes from currentresults.com. We ranked each city across each of our factors and averaged the rankings using different weights. We gave 20% weight to dog parks, dog-friendly shopping areas and dog-friendly restaurants. Walkability and weather factor got 15% weight. And we gave 10% weight to median home value. Finally, we created index based on our weighted rank. We gave each city an overall score. The highest-ranking city scored a perfect 100, while the lowest-ranking city scored a 0.